Kit’s only goal is to stay alive. Right now, that means dodging brutal gangs while peddling fake I.D.s on the back streets of Winnipeg. But things get complicated when Kit sells a license to a girl named Aura – a girl who could almost be her twin. Caught in the wrong place at the wrong time, Kit is plunged into an underground society with heart-stopping surprises at every turn. To protect herself, she’s forced to assume Aura’s identity. But storm clouds are gathering on the horizon, and when Kit learns the truth about Aura, she knows she has to get out before the storm breaks. There’s only one problem: escape isn’t an option. Suddenly, staying alive just got a lot harder. Downburst took no time at all to get into the action. Sometimes, a book can take its sweet time getting me hooked enough to enjoy it, but I was already interested with Kit’s story and what would happen to her by the end of the first chapter. I love a strong female lead that can take care of herself and Kit was an amazing female lead. Even though there were love interests, I didn’t feel like they hindered her in any way. She remained a strong willed woman throughout the book. I enjoyed Robison’s world building. There were plenty of supernatural abilities with a Native American twist on it that made for an interesting read. I was able to see why people compared it to The Hunger Games with kids having to train together for a war, and deaths I didn’t see coming, but I personally wouldn’t make that comparison. 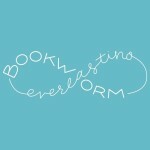 My biggest concern was that it would start getting boring with so much of the action opening up the book. I didn’t find that to be the case. There were too many questions that kept me guessing and wondering where the book would go. I was definitely getting anxious for some answers. Fortunately, by the end of the book not only were my questions answered, but there were plot twists everywhere! The ending left me hanging and wanting to read the second book immediately. I’m intrigued to see where Coiled Snake, the sequel, takes us. If Downburst sounds interesting to you be sure to pick up Coiled Snake and Firestorm. 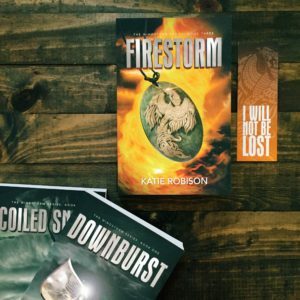 Firestorm, the final book in the trilogy, was released on June 7th and can be purchased at Amazon. Also, enter the giveaway for your chance to win a signed copy of the trilogy, a compass necklace, bookmark, and a journal! The seven tribal nations are at war, and as a taporo Kit can finally do something to save her people. But Kit can’t shake the feeling she’s playing a game she doesn’t understand, and if she agrees to fight, she’ll lose the ones she loves the most. 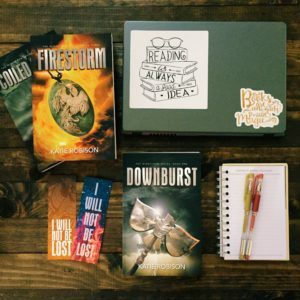 Firestorm is the highly anticipated conclusion of the The Windstorm Series, a fast-paced fantasy trilogy that critics are calling a “thrilling head-rush of an adventure” (Kirkus Reviews).